Helianthemum Rose Glory and the others of these European rockrose relatives make a bold statement in the spring and often again in the Fall. Each flower on Helianthemum Rose Glory may only last a day or two but the plants produce so many of them that the plants are covered in dark pink blooms for several months. Helianthemum Rose Glory with its green leaves seems to peter out in our inland garden when placed in full sun or in dark shade. Helianthemum Rose Glory suffers if to many feet tread upon it but put in the right location this plant will put on a wondrous show. I get the best performance from Helianthemum Rose Glory when I place them in an eastern exposure with regular but infrequent watering. The varieties like this one with the green leaves are even more tender in the sun and I will plant them in a semi-protected location even near the coast. I have not seen them damaged due to cold weather and have watched them weather temperatures into the mid teens. Sadly Helianthemum Rose Glory often looks pitiful in a small nursery container but will reward nicely if given a proper spot in the garden. 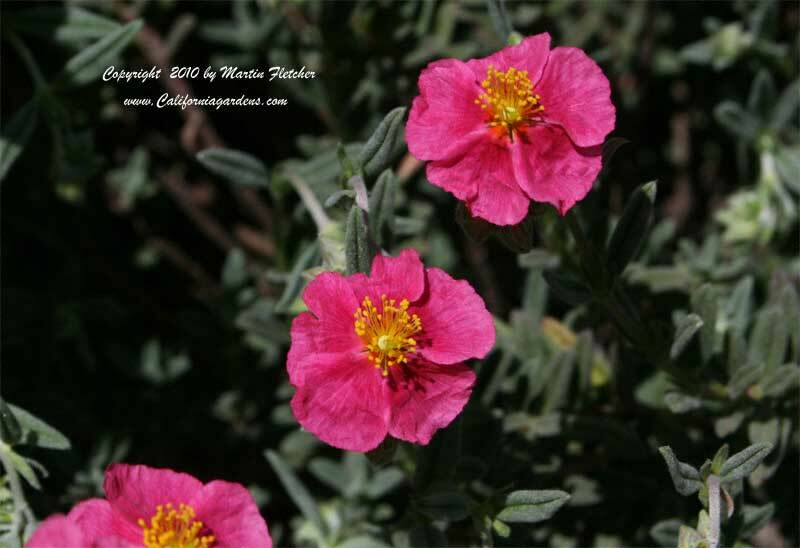 Dark pink flowers and foliage of Helianthemum Rose Glory - Dark Pink Sunrose. High resolution photos are part of our garden image collection.